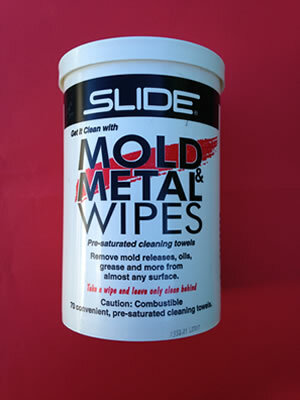 Clean and restore surfaces, easily wipes on and off. Removes plate out, oxidation and stains. Leaves no residue, brings surfaces to a high luster. Safely removes plate out, oxidation and stains on fine tooling surfaces quickly and cost-effectively. 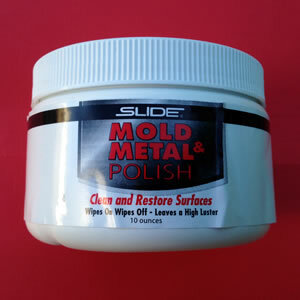 Ideal for all types of moulds, dies and fixtures, it restores surface finish while providing a high luster sheen. The polish has proven effective on steel, stainless, aluminium, brass, bronze, beryllium, kirksite, zinc, powered metals and other materials used in injection, blow, extrusion, compression and rim moulding. Fast convenient, pre-saturated sheets quickly clean almost any surface. *Use for preparing moulds for production or storage; touch-up cleaning during production; surface prep prior to secondary operations; and general maintenance and all purpose cleaning. Using wipes reduces solvent consumption and VOC’ emissions.